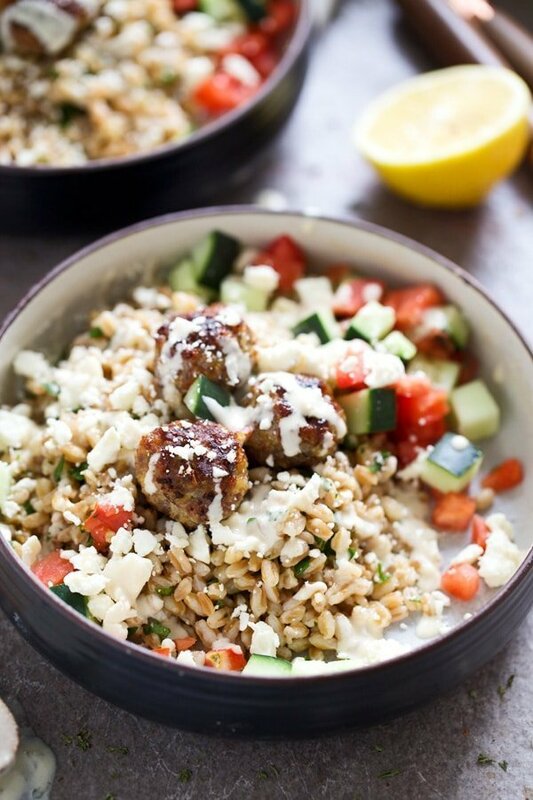 If there were a healthy meal I could eat over and over again, it would be these Greek Meatball and Farro Bowls with Easy Tahini Sauce. 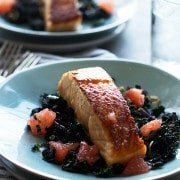 For one, they’re easy to throw together – not throw it all in a pot easy, but easy nonetheless. Two, it’s a full meal all in and one. Protein? Check! Healthy grains? Check! Vegetables? Check! 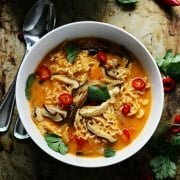 Creamy, addictive tahini sauce? Check! And three, they’re, for lack of a better word or phrase, so freaking delicious. I’ve been making a variation of this for a while now, except usually I serve the farro, cucumber and tomato mixture with marinated, grilled chicken instead of meatballs. It’s something we adore and intend to make again, however, this time, since ground pork was on sale, I thought I’d give it a go with a Greek-inspired meatball instead. I’m kind of in love with the results. In short, here’s how it goes down: Cooked farro is tossed with tomatoes, cucumbers and a lemon vinaigrette of sorts. 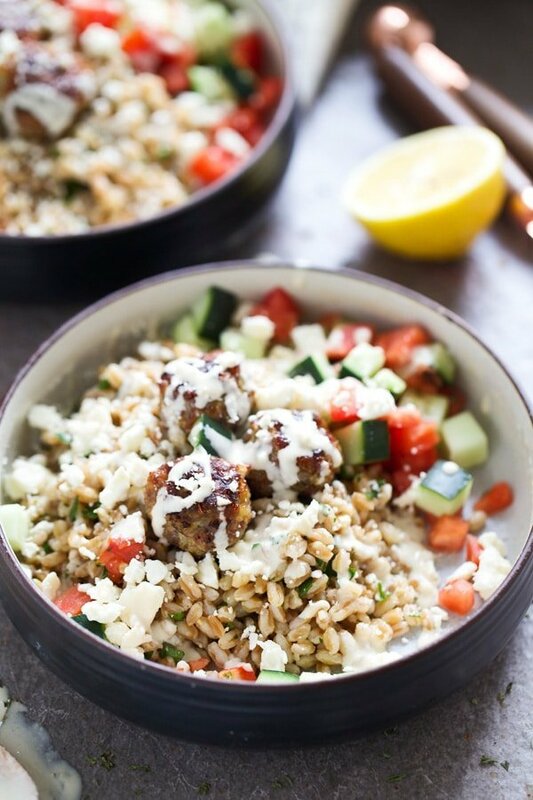 The farro is divided between bowls and topped off with garlicky pork meatballs and then smothered in a super quick and easy homemade tahini sauce. The bowls are garnished with a little bit of feta cheese and some chopped parsley and they’re ready to be devoured. And trust me, they will be devoured. So let’s talk meatballs. 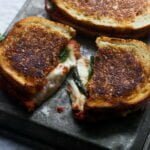 Honestly, I’ll eat meatballs any way I can get my hands on them – in a classic like spaghetti and meatballs, nestled into lettuce wraps, smothered in cheese and between bread, the list goes on. And while I love a traditional meatball made with ground beef and Italian sausage, I equally adore one made with ground chicken, ground turkey or in today’s case, ground pork. 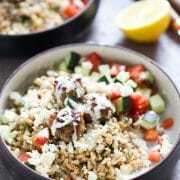 Because pork has so much flavor, I tried to keep the ingredient list pretty simple, while still emphasizing the Mediterranean flavor I was looking to compliment in the farro and tahini sauce. 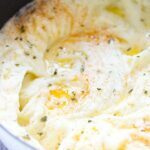 Onion, garlic, oregano, plenty of salt and a touch of rosemary made the cut for additional flavor, while a scant amount of panko and an egg yolk made the cut to bind everything together. Similar to any meatball recipe, you only want to mix the pork and other ingredients until they’re just combined to avoid overworking the dough, turning the meatballs into dense hockey pucks. Instead of browning the meatballs in a ton of oil, I opted to line them up on a cookie sheet and bake them instead, saving countless grams of fat and calories. At 400 degrees, they still get perfectly brown and crusty on the bottom, but stay nice and moist on the inside. 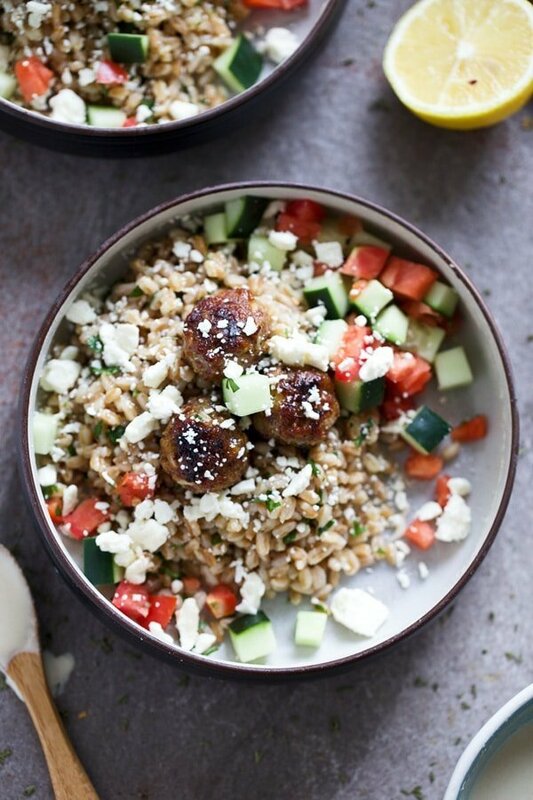 What I love most about this meal, aside from how tasty it is, in the time it takes the meatballs to bake, you can make both the farro and tahini sauce, so not only is it crazy delicious, it’s also a ridiculously efficient meal to make as well. Plus, it’s just as good for leftovers the next day, which in my book, makes the perfect recipe. 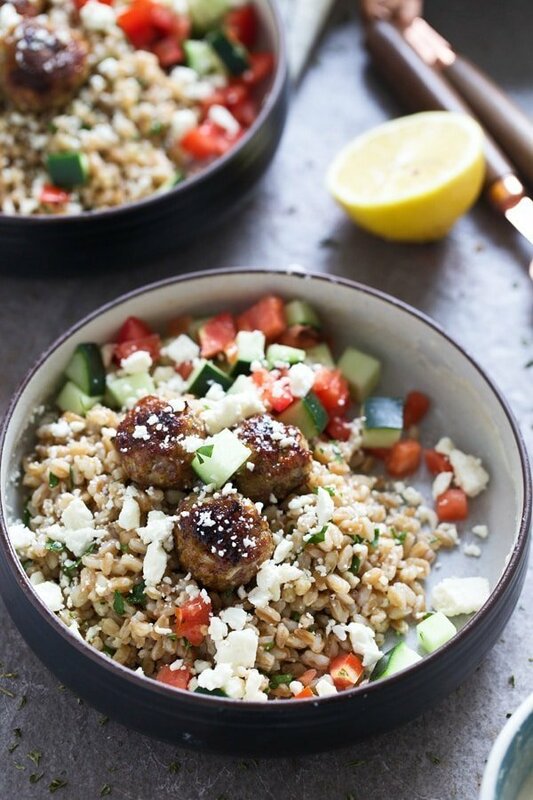 Greek Meatball Farro Bowls with Easy Tahini Sauce are an easy way to get your protein, grains and vegetables in one DELICIOUS meal. Preheat oven to 400 degrees. Spray a small baking sheet with non-stick cooking spray. Add pork, onion, 3 garlic cloves, oregano, rosemary, 1/2 teaspoon salt, panko and egg yolk to a medium bowl. Use hands to mix the ingredients until combined. Use a small ice cream scoop to form the mixture into 13 meatballs. Place on prepared baking sheet. Bake for 15-20 minutes or until cooked through and golden brown. While meatballs cook, add farro, 1/2 teaspoon salt, 2 cups water and chicken stock to a medium pot. Bring to a boil and then reduce to a simmer. Cover and simmer for 10-12 minutes or until liquid is evaporated and farro is cooked. Add 3 tablespoons lemon juice, honey, dijon, olive oil and parsley. Stir to combine. Season with salt and pepper. Add tahini, remaining grated garlic clove, water, lemon juice and salt together in a small bowl. Season with salt and pepper. Evenly divide farro between four bowls. Divide meatballs, cucumber and tomato between bowls. Drizzle with tahini sauce. Sprinkle with feta cheese. 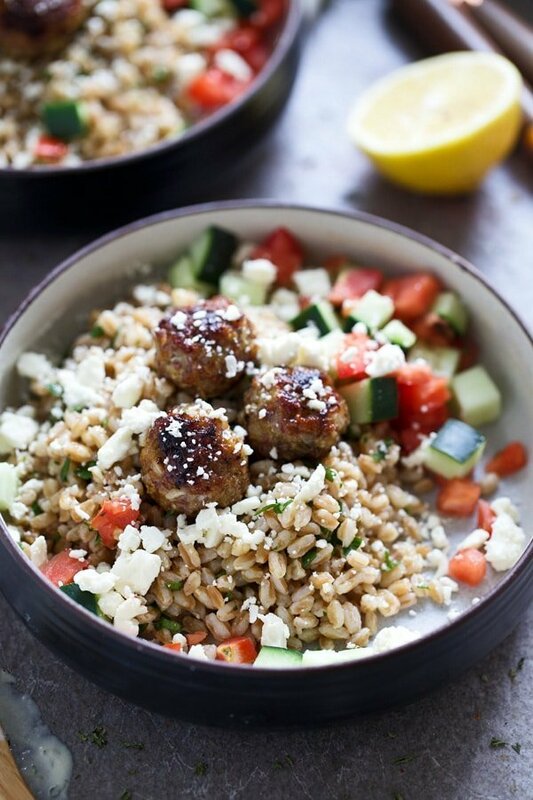 6 Responses to "Greek Meatball Farro Bowls with Easy Tahini Sauce"
I made this today, as published. It was delicious! I just want to say I recently stumbled across your blog via Pinterest! I was looking up Tater Tot recipes with my picky husband, and we found your Loaded Bacon Cheeseburger Tots. 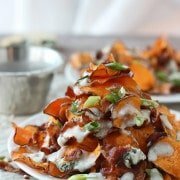 We made this fun recipe for our monthly couples’ game night- and it was such a hit! I added Tex Mex shredded cheese and chilli powder to the hamburger meat- we were in FLAVOUR TOWN! I highly recommend these zesty additions. 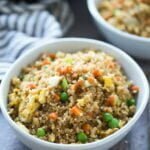 I am also intrigued in trying your exotic farro bowl recipe!!! So glad you liked them Pamela! I hope you try more recipes! Thanks for the comment! This recipe is a stunner – I’m currently devouring the leftovers for lunch after making for dinner last night. I highly recommend doubling the meatballs because you can never have too many meatballs! I will definitely be making this again. Thanks for the recipe! I agree – you can never have too many meatballs! So glad you liked it!